In this June 12, 2018, file photo, U.S. President Donald Trump, left, and North Korea leader Kim Jong Un walk from their lunch at the Capella resort on Sentosa Island in Singapore. 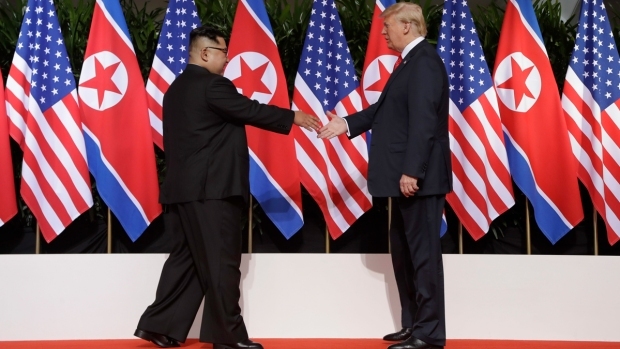 Between the two of them, President Donald Trump and North Korea's Kim Jong Un have created a mythology about the U.S.-North Korean relationship that could gain another chapter when they meet in Hanoi this week for their second summit. 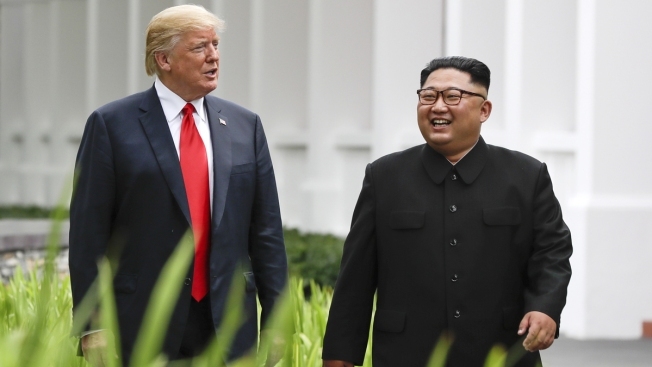 According to that mythology, the U.S. came to the brink of war (says Trump) with a rising nuclear power able to rain destruction on U.S. soil (says Kim). 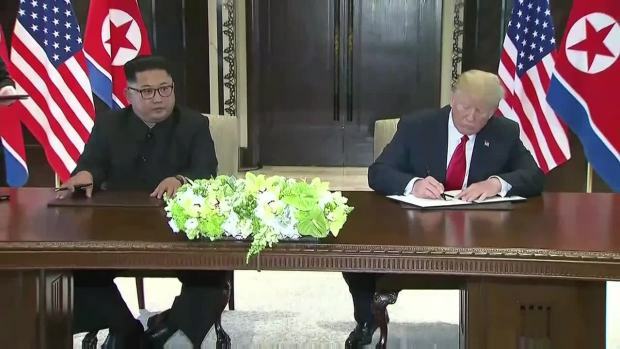 Talk (by Kim and Trump) of nuclear buttons on desks evolved into some kind of "love" (says Trump) and now the two are on the road to a nuclear-free and even prosperous North. Trump tweeted cheerily in anticipation of the summit: "North Korea will become a different kind of Rocket - an Economic one!" The reality is more prosaic, though still historic: Two hostile nations — one wealthy, one impoverished, both bristling with weapons — are talking at the highest level. Trump came back from the first summit last June claiming the marquee achievement of getting North Korea on board with "total denuclearization" and maintaining that process was immediately underway. But Kim has never renounced nuclear weapons development. The Pentagon last month called the North an "extraordinary threat." Dan Coats, Trump's national intelligence director, earned the president's ire when he told senators the North is taking actions inconsistent with denuclearization and that the North considers its nuclear arsenal critical to its survival. The next chapters are yet to be written by Trump and Kim. Their story so far has been marked by overwrought accounts of the perils at hand and over-the-top pronouncements of progress. MYTH: The U.S. and North Korea were about to go to war when Trump came to office. "When I came in, North Korea was — it looks like it was going to war. You know that. It was going to happen, bad things." — Trump at rally in El Paso, Texas, Feb. 11. "If I had not been elected president of the United States, we would right now, in my opinion, be in a major war with North Korea with potentially millions of people killed." — Trump in State of the Union speech, Feb. 5. Previous presidents left Trump "with a major war ready to start." — Trump tweet Jan. 24. REALITY: Trump cites no evidence to support what he sometimes states as a fact and other times as his opinion. The idea that war was close rings false through the foreign policy establishment and is disputed by people who served under President Barack Obama, such as Ben Rhodes, who was deputy national security adviser, and John Brennan, Obama's CIA chief. To the extent that belligerence is a harbinger of war, the risk increased under Trump. Agitated by North Korea's provocative nuclear and missile tests in 2017, Trump engaged with Kim in an escalating war of words as each man bragged about the nuclear buttons within reach. Insults flew about the U.S. "dotard" and the North's "rocket man." Trump departed from recent predecessors in openly warning of war with the North, telling reporters in August 2017 that if the North Koreans continued to make threats, "They will be met with fire and fury like the world has never seen." And he told the United Nations that if the U.S. is "forced to defend itself or its allies, we will have no choice but to totally destroy North Korea. Rocket Man is on a suicide mission for himself and for his regime." North Korea's aggressive testing and the ferocious rhetoric of the two leaders that year triggered war fears among South Koreans, who over the decades had grown stoic in the face of threats from their bellicose neighbor. Obama is known to have pointed to North Korea as a vexing problem in a postelection meeting with Trump, not necessarily as one about to erupt into warfare. MYTH: North Korea can mount a nuclear attack striking anywhere in the U.S.
"It's not a mere threat but a reality that I have a nuclear button on the desk in my office. All of the mainland United States is within the range of our nuclear strike." — Kim, Jan. 1, 2018. North Korea no longer needs to test intermediate and intercontinental missiles, or to conduct nuclear tests, because "the work for mounting nuclear warheads on ballistic rockets was finished" and "whole processes of developing nuclear weapons were carried out in a scientific way." — North Korea's official Korean Central News Agency, summarizing Kim's remarks at a central party meeting in April 2018. REALITY: Kim is inflating the North's nuclear and missile capabilities. The North did demonstrate advanced weapons capability during its torrent of nuclear and missile tests in 2017. It flew two new intermediate-range missiles over Japan and threatened to fire those weapons toward the U.S. territory of Guam. It also tested three developmental ICBMs, including the Hwasong-15 that demonstrated potential range to reach deep into the U.S. mainland. But the ICBM tests showed no clear sign that the North perfected the technology needed to ensure that a warhead could survive the harsh conditions of atmospheric re-entry. While experts said North Korea needed additional flight tests to determine the reliability and accuracy of its ICBMs and establish a capable re-entry protection system, the North has performed no known test of these weapons since the Hwasong-15 launch in November 2017. MYTH: Trump is the only president to make any progress with North Korea. "This isn't the past. This isn't another administration that never got it started and, therefore, never got it done." — Trump after the June 2018 summit. The North Koreans in "one case, they took billions of dollars during the Clinton regime. ... Took billions of dollars and nothing happened." He said of President Bill Clinton: "He spent $3 billion and got nothing." — after June summit. On past presidents: "They've been talking about this for many, many years, and no administration has done anything." — remarks Wednesday. REALITY: He's wrong in suggesting his administration is the first to start work on denuclearization with North Korea. The Clinton and George W. Bush administrations both did so. And his numbers are off. The Clinton and Bush administrations combined to provide some $1.3 billion in food and energy assistance from 1995 to 2008, according to the Congressional Research Service, a nonpartisan arm of Congress. Clinton reached an aid-for-disarmament deal in 1994 that halted North Korea's plutonium production for eight years, freezing what was then a very small atomic arsenal. 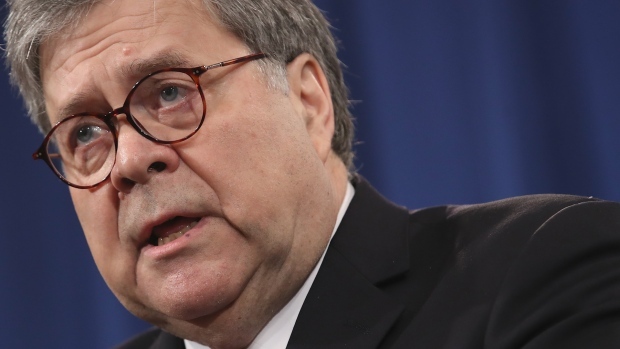 Bush took a tougher stance toward North Korea, and the 1994 nuclear deal collapsed because of suspicions that the North was running a secret uranium program. But Bush, too, ultimately pursued negotiations. That led to a temporary disabling of some nuclear facilities, but talks fell apart because of differences over verification. MYTH: North Korea has substantially retracted its nuclear weapons capability. "Accordingly, we declared at home and abroad that we would neither make and test nuclear weapons any longer nor use and proliferate them, and we have taken various practical measures." — Kim in his Jan. 1 address this year. REALITY: Kim's description of the outcome of his summits with Washington and Seoul in 2018 doesn't match what actually happened in past months. In his three meetings with South Korean President Moon Jae-in and his first with Trump, Kim signed vague statements pledging the "complete denuclearization" of the Korean Peninsula, without describing how and when it would occur. The North for decades has been pushing a concept of denuclearization that bears no resemblance to the American definition. It has vowed to pursue nuclear development until the U.S. removes its troops from South Korea and retracts its "nuclear umbrella," which assures South Korea and Japan that America will defend them from an attack, using nuclear weapons if necessary. The North did suspend its nuclear and long-range missile tests and unilaterally dismantled its nuclear testing ground and parts of a rocket launch facility, without the presence of outside experts. But those measures were not seen as material steps toward reducing the North's nuclear capability. The North never did declare it would not make nuclear weapons. 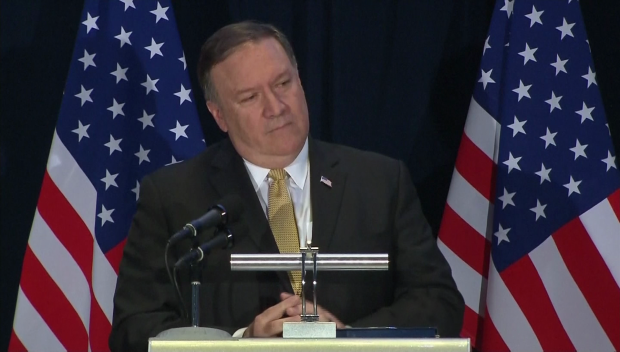 In fact, Kim has never formally withdrawn the order he gave in his New Year's speech in 2018, when he said the North's "nuclear weapons research sector and the rocket industry should mass-produce nuclear warheads and ballistic missiles." What to make of these nuances? 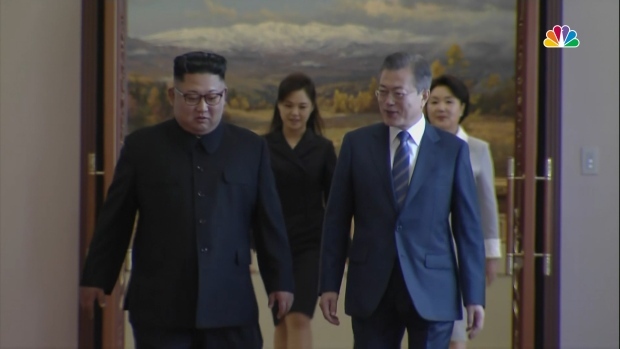 Some analysts see Kim hinting at an agreement that falls short of full disarmament, but that could still limit the North Korean threat — essentially keeping the North's rudimentary nuclear capability from growing or advancing further. Or his comments may disguise a lack of intent to back down on nuclear weapons development. The Pentagon said in a report last month that "while a possible new avenue to peace now exists with North Korea, it continues to pose an extraordinary threat." MYTH: South Korea is doubling its payment for the U.S. troops stationed on its soil to defend against attack from the North. "They were paying about $500 million for $5 billion worth of protection. And we have to do better than that. So they've agreed to pay $500 million more." — Trump at Cabinet meeting Feb. 12. "They agreed to pay, yesterday, $500 million more toward their defense. Five-hundred million, with a couple of phone calls. I said, 'Why didn't you do this before?' They said, 'Nobody asked.' — El Paso rally Feb. 11. REALITY: Trump's numbers bear almost no resemblance to those in a cost-sharing deal worked out this month by negotiators from the two countries. South Korea agreed to pay about 8 percent more, not 100 percent more. Its contribution in the one-year deal increases to about $924 million (1 trillion won) from about $854 million (960 billion won). South Korea financed about 41 percent of the "day-to-day non-personnel stationing costs" for the U.S. troop presence last year, according to the U.S. Forces Korea Strategic Digest . That's about $2 billion, with the U.S. covering the majority of that expense. Trump did not explain his reference to "$5 billion worth of protection." However, both countries cover costs that are outside the agreement and gain benefits not addressed by the deal. For example, South Korea paid about 90 percent of the cost to expand Camp Humphreys, south of Seoul, which is the largest U.S. military base outside the U.S. mainland. And the U.S. covers personnel costs not included in the deal but gets rent-free land, tax breaks and billions from arms sales to the South. PARTIAL MYTH: The remains of U.S. soldiers have been brought home from North Korean territory, thanks to the first summit. "We got back our great fallen heroes, the remains sent back today, already 200 have been sent back." — Trump at Minnesota rally in June 2018, days after the summit. "In a short 15 months, relationships built, hostages & remains ... back home where they belong." — Trump tweets Thursday Jan. 24. REALITY: Trump has persistently misrepresented progress in retrieving the remains of U.S. soldiers from the war after securing Kim's agreement to cooperate on the matter. When he told the Minnesota rally that the remains of 200 were already back in the U.S., none were. In August, the North sent to the U.S. 55 boxes that were said to contain American war remains from North Korea. The U.S. does not yet know for sure how many U.S. soldiers are in those boxes. The lead scientist in the identification work, John Byrd, told The Associated Press last week that it appears the boxes contain between 50 and 100 sets of remains, and that roughly 80 percent of them are likely to prove to be Americans. The rest probably are South Korean soldiers. Just three sets of remains have been positively identified, but Byrd said several more may be announced within a few weeks. Meanwhile, North Korea balked at negotiating with the Pentagon on terms for recovering any of the thousands of additional remains. Between 1996 and 2005, despite hostile relations, joint U.S.-North Korea military search teams conducted 33 joint recovery operations and recovered 229 sets of American remains. As for his reference to "hostages," Trump is correct that Kim agreed to return several Americans detained in the North. Associated Press writers Foster Klug and Robert Burns contributed to this report.